Boston Medical Center’s Food Pantry reached a milestone earlier this year, serving one million people since its launch in 2001. 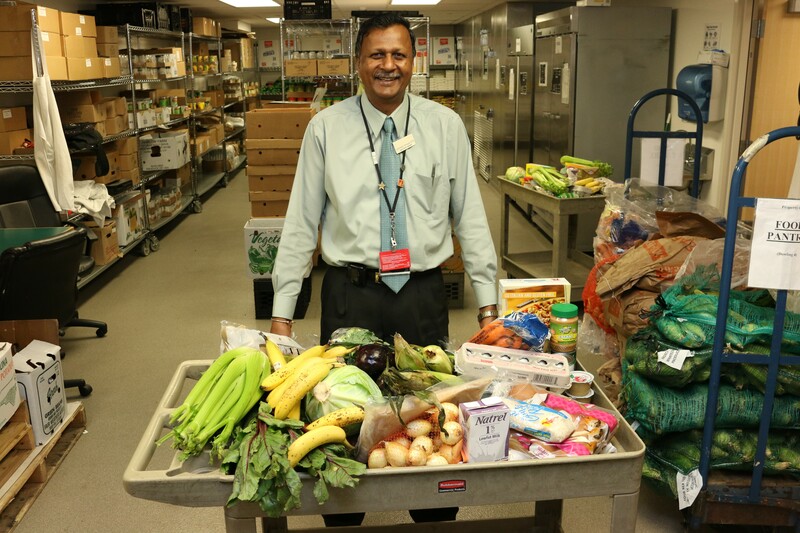 The program is the first ever hospital-based food pantry in the nation, supporting food-insecure patients and their families with packages of healthy fresh food and pantry staples. The Food Pantry’s beginnings were born out of necessity. BMC pediatricians were recognizing malnutrition in the children they were treating. They wanted to help make healthy food easily accessible to families who were unable to afford it. A new, centralized food pantry was created to replace smaller department-based efforts to provide food and necessities to low-income patients. Latchman Hiralall, DTR, food pantry manager and registered dietetic technician, has been with the pantry since it opened 17 years ago. The Food Pantry has grown through the years, first serving children and pregnant women. Over the next five years, the number has grown to include patients from the Refugee Center, Geriatrics, Family Medicine, Cancer Care and Primary Care. Currently, the pantry serves more than 7,000 patients and their families every month. “What makes the Food Pantry truly unique is the level of personalization we provide to patients. Doctors write a food prescription based on the patient’s illness and dietary needs, and we work to provide packages that best suit that patient and his or her family. The system is directly linked to the patient’s medical record, so physicians can track patients who use the pantry and measure progress on dietary goals,” explains Hiralall. The Food Pantry is solely supported through the philanthropic efforts of corporate partners, grants and individual donors. The bulk of the program’s food is sourced from the Greater Boston Food Bank. The pantry also receives dollars and in-kind support from corporate partners such as Ocean State Job Lot and nearby Whole Foods Symphony Hall. These partnerships, among others, help the Food Pantry bring in its quota of 15,000 pounds of food per week. Hiralall notes that many BMC patients struggle with illnesses such as type 2 diabetes, obesity and heart disease. These nutrition-related diseases are part of a growing epidemic across the country caused by a dearth of affordable fresh food options in many low-income neighborhoods. To bring more fresh produce to patients, BMC partnered with Recover Rooftops and Higher Ground Gardens to plant a farm on top of its power plant building in 2016. The 7,000 square foot farm produces a variety of kale, collards, lettuces, peppers, tomatoes and eggplants. Beehives have been added to support pollination and produce honey. Last year’s harvest yielded 6,000 pounds of fresh food for the pantry, Demonstration Kitchen and patient meals. With such a successful yield and positive patient response, the hospital is looking to expand its farm to other building rooftops. The success and continued evolution of BMC’s Food Pantry has won nationwide attention. These days, Hiralall finds himself on the phone talking with staff from hospitals across the country from San Francisco, California, to Raleigh, North Carolina, seeking to replicate BMC’s model into their own health systems. Prescriptions to the Food Pantry show significant impact on patient health. Obese patients lose weight, require less medications and reduce hospital visits. Children regain ground on their growth charts. After 17 years and one million lives touched, the Food Pantry continues to be a leading example of BMC’s innovation, collaboration and resolve to help patients become healthy and stay well. BMC has a long-standing commitment to serving vulnerable populations, which includes treating both medical needs as well as underlying social determinants of health. The Food Pantry, Teaching Kitchen and Rooftop Farm play a key role in carrying out this mission.